Despite the fact that Tottenham had appeared to give up on the competition, I still held out some hope that we might progress – the delusion of an avid fan who, despite his best efforts, just cannot abandon all hope. After 75 minutes, I had managed to allow the pessimism to take over and had reached the acceptance stage as the inevitable loss was approaching, but then Nacer Chadli scored twice and Harry Kane was taken down in the area for what should have been an aggregate tying penalty and I was back believing that the impossible could happen. Of course, it did not and a late spot kick for Benfica denied Spurs a win on the night as the second leg ended 2-2, the competitive aspect of the season is over, so this will be my last post complaining about centering on Tottenham this campaign, from now on – even though I will be watching all their games religiously (with candles and everything) – the title race and relegation battle will be the primary focus. Before that though, my judgement on who should be coming back next year for Tottenham. Tim Sherwood – apart from his tactical shortcomings, obsession with playing Nabil Bentaleb (who had a better game on Thursday night) and history of being an Arsenal supporter, the fact that he spent the match against Benfica in the crowd rather than on the touchline following on from his spat with his opposing number in the first leg, shows that his primary concern is himself rather than the team. 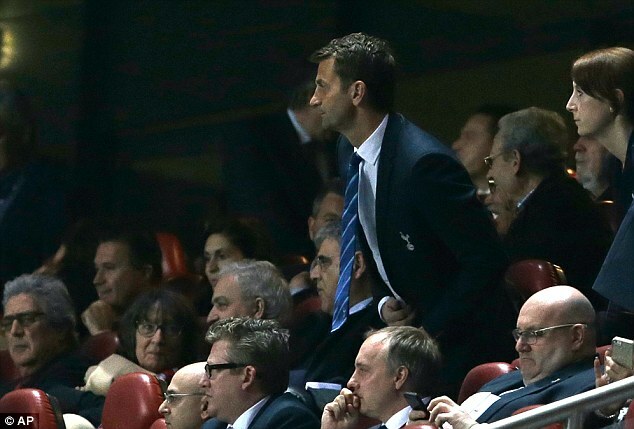 Even if it mean shaking Jorge Jesus’ hand, Sherwood should have been on the sideline urging his team on, not sitting behind Daniel Levy in the stands. Roberto Soldado – It is not a good sign that when your £26m striker is replaced with a young player who at the moment looks about three levels below being average Premiership standard (Harry Kane), your team improves dramatically. I follow Spanish football sporadically (meaning I watch El Clásico and listen to Sid Lowe talk about it on the Guardian Football Weekly Podcast) so I was aware of Soldado’s abilities during his time at Valencia, but in a Tottenham shirt he has looked so bad it actually baffles me. Then again, I was a big fan of the Helder Postiga signing too so maybe I should not be a scout any time soon. Harry Kane – Maybe on loan to see him sharpen up – love his energy, do not like his positioning or lack of finishing ability. Michael Dawson – I love him, but his lack of pace is telling and I am not sure I can watch him pump another 40 yard ball from the middle of the park to the left-wing, only for it to drift aimlessly out of play. Nabil Bentaleb – Just so that no other manager is tempted to play him every match. Brad Friedel/Huerelo Gomes – I’d take Jordan Archer as the reserve goalkeeper, assuming Hugo Lloris does not move to Paris Saint-Germain this summer. Emmanuel Adebayor – Maybe controversial given his better form since December, but if there was a good offer for the Togolese striker I would take it. Adebayor is completely feast or famine, he could win you a match one week, then be a complete waste of a name on the squad sheet for the next month. For someone on his wages, he should be playing well every single game and he just does not. Andros Townsend – Yes he is talented, but if I watch him drift in from the wing and take another shot that is blocked on the edge of the area again, I think my ears might start bleeding. Vlad Chiriches, Erik Lamela, Etienne Capoue – all came in last summer and have shown flashes of being competent, but have yet to prove they can make it in English football. Lamela has been perhaps the worst of those, but he was the club’s record signing and I would give him at least 12 more months to show his talent – after all, Gareth Bale did not develop until a couple of seasons into his Tottenham career. These would not be in my starting XI, but are good backup players: Mousa Dembele (unless his form improves to where it was last season); Gylfi Sigurdsson; Kyle Naughton, Zeki Fryers, Tom Carroll, Nacer Chadli (saved by his two goals and a showing that, while he does not look good enough on the wing, behind a striker he is actually a solid player); Younes Kaboul. GK: Lloris; RB: Walker; LB: Rose; CB: Vertonghen; CB: Chiriches; Defensive Midfield: Sandro; Central Midfield; Paulinho; RW: Aaron Lennon; LW: TBD; Behind Striker: Christian Eriksen; Striker: TBD. Thanks for the (awful) memories for 2013/14 Tottenham – see you in August (well I will be watching the game against Southampton on Sunday too, but without any hope of this campaign going anywhere). It was an up and down week for Manchester United supporters, starting with their worst nightmare – losing at Old Trafford to Liverpool, allowing their old adversaries to stay in the title race. Following a spell when they had not conceded a penalty at home in the Premiership since 2011, United contrived to give away three in a single game -although the third was a clear dive by Daniel Sturridge, which also got Vidic sent off. Two of the spotkicks were converted by Steven Gerrard, but the Liverpool captain missed the third and thus failed to equal Jan Molby’s feat of scoring a hat-trick of penalties in a single match for the Reds. Nevertheless, a goal from Luis Suarez completed the 3-0 rout for Brendan Rodgers’ team, who are just four points off the top of the table, with a game in hand on the leaders. There was a better performance by the Red Devils in the Champions League, as they beat Olympiacos 3-0 to overturn the 2-0 first leg deficit and progress to the quarter-final stage, where they will face the holders, Bayern Munich. Robin Van Persie was the hero for United, scoring all three goals (a penalty, a free-kick and one from open play) and, as I suggested in a tweet on Wednesday night, some are comparing him to Mark Robbins, whose winning goal in a 1990 FA Cup tie against Nottingham Forest reportedly saved Sir Alex Ferguson’s job. However, even if David Moyes will enjoy a temporary reprieve thanks to this success, the underlying flaws with his management at Old Trafford have not gone away just because they beat a Greek team they should never have been behind against. Chelsea also progressed to the final eight of the Champions League as they beat Galatasary 2-0 at Stamford Bridge and they will face Paris Saint Germain in the quarter-finals, while Real Madrid take on Borussia Dortmund, and Barcelona play Atletico Madrid in the other two ties. In the Premiership last weekend, there was less good news for Chelsea who were beaten 1-0 by Aston Villa, though they were not helped out by Chris Foy’s baffling decision to send off Willian for what seemed like a complete innocuous challenge. Fabian Delph scored a brilliant winner for Villa – guiding the ball into the far corner with a back heel flick – then things got worse for the Blues in the final minutes as Ramires was dismissed for a stamp and Jose Mourinho was sent to the stands for encroaching onto the pitch. Following the match, Mourinho claimed that the loss did not affect the title race since Chelsea had not been in it before the game (the thinking being that Manchester City’s three games in charge were more valuable than the 9 point advantage his team had) but what the defeat really has done is open up the race. City overcame losing Vincent Kompany early on in their match with Hull to win 2-0, so they now sit six points behind Chelsea with three extra fixtures remaining; while Liverpool and Arsenal’s victories mean they are both four points behind with one game in hand. The relegation battle is also tightening up and Fulham’s 1-0 victory against Newcastle last Saturday means that the bottom three are now separated by just a single point, as Cardiff were beaten with a last-minute goal by Everton at Goodison Park and Sunderland were held to a 0-0 draw at home against Crystal Palace. While the Black Cats have played fewer games than any of the teams around them, they still face a three point gap between themselves and safety after West Brom picked up their first victory under Pepe Mel as they came from behind to defeat Swansea 2-1 in South Wales, meaning the Swans are still without a win since they replaced Michael Laudrup with Gary Monk. In the other two fixtures last weekend, Stoke beat West Ham 3-1; while Southampton overcame a late comeback by Norwich who scored twice in a minute to take the score from 3-0 to 3-2, but a late fourth for the Saints confirmed the three points and pushed the Canaries closer to the bottom three. This weekend, the highlight of the fixtures is a meeting between two of the title contenders as Chelsea host Arsenal in the early kick off, a match that takes Arsene Wenger’s total in charge of the Gunners to 1,000, though he has not enjoyed a victory over Jose Mourinho during his tenure. With at least one of those two London clubs set to drop points, it gives an opportunity to Liverpool and Manchester City to improve their own positions and they face the bottom two in the table, Cardiff and Fulham respectively. Manchester United will hope to build on their midweek European success when they travel to East London to face West Ham; free-falling Swansea face a daunting trip to Everton; Hull host West Brom; and Norwich – who have conceded just one goal at home in 2014 – entertain Sunderland. There is a Midlands derby between the two teams in the middle of the table, Aston Villa and Stoke, kicking off on Sunday at midday Eastern time…expect a midfield battle for that one. Elsewhere, Southampton will be beating Tottenham at White Hart Lane; and unlike Alan Pardew (still serving a stadium ban), Crystal Palace will be at St. James’ Park to play Newcastle.